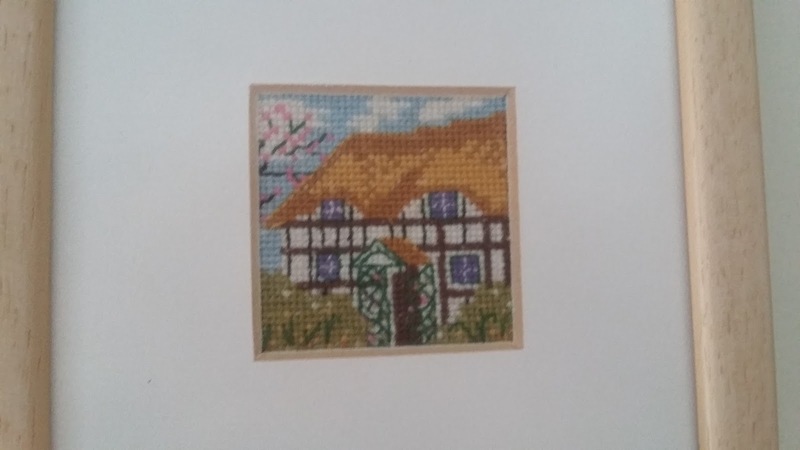 This week's Blogger is also taking part in my Easter Treasure Hunt blog hop so you'll see some great Easter themed stitching there this week. I'd like to introduce another of our European bloggers who blogs in English just to make it easy for us! Hello everyone. I am Ariadne Skyrianidou from Greece. I am a teacher of English as a Foreign Language in a Primary State school in Thessaloniki, the second largest city in Greece. I am married to dear Themis and am the proud mum of a 21-year-old son Miltos from my first marriage. Sweet Barca, a stray dog we adopted four years ago is the other member of our family. I am a very active person. I am a member of the Teachers’ Association Drama Club and we mount plays for children, schools and charity. I also belong to a crafty group with which I really enjoy learning new techniques and make things for charity. I love reading, watching movies, collecting sea glass and have recently taken ceramics classes. 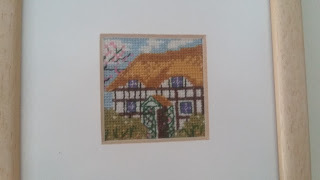 I have been stitching since I was a kid. My grandmother Ariadne taught me how to and I admit at first I didn’t really like sitting down and making all those stitches. 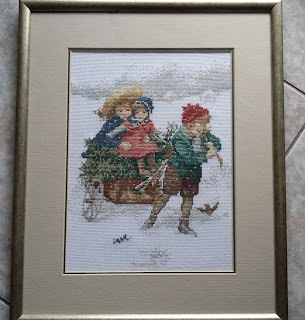 But when I was pregnant to my son and positioned away from home as a teacher I met with Needlecraft and Cross Stitcher magazines and started stitching again. It was a revelation and haven’t stopped since. I have been blogging since January 2012. I must say I was more active at first. Nowadays I blog about once a month as if I am keeping a journal. I was inspired to have my own blog after following the blogs of Margie of Resurrection Fern, Geninne’s Art Blog, Sonia’s Cozy Memories blog and a couple more.I loved their art making and gorgeous photos and wanted to do the same. The name of my blog was a spontaneous choice because everywhere on the Internet I visited I used to mention my country next to my name so that people know I am from Greece. I definitely am a OAAT (One at a time) stitcher. I try to finish each piece I start and in between make smaller projects for exchanges but not too many. I usually concentrate on one thing. 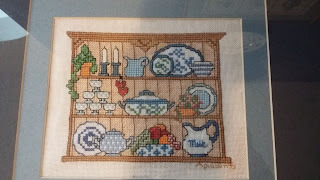 I am an eclectic stitcher and choose various different projects usually inspired by what other people stitch but I usually stitch things I already have in my basket. 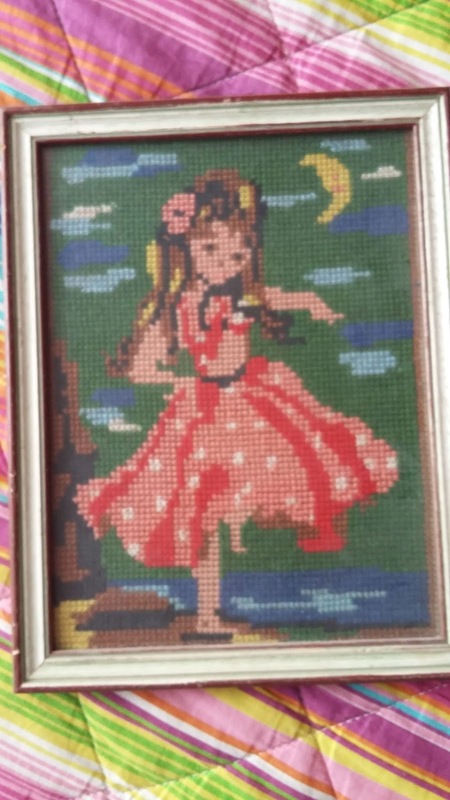 I stopped buying new things due to the financial crisis in Greece but I have friends who pass me on the things they don’t want to stitch or they find at thrift stores! I am lucky! I can’t say I have. 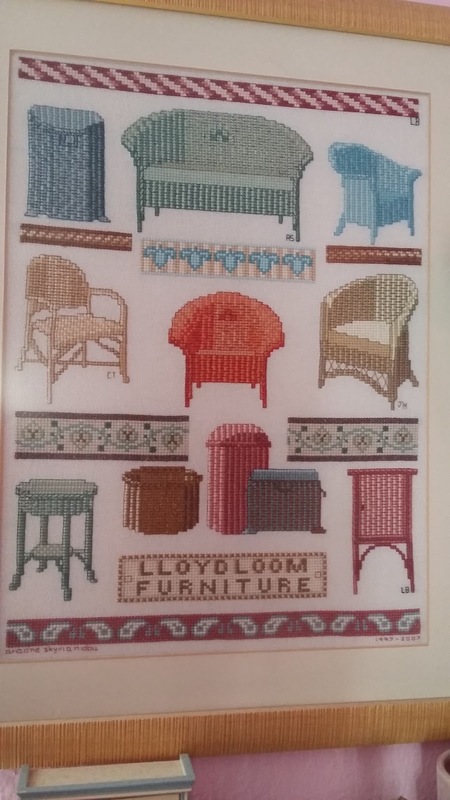 I really like the designs of Lizzie Kate, Silver Creek Samplers, Prairie Schooler,Thea Gouverneur, Mirabilia,Little House Needleworks, Carriage House Samplings, The Little Stitcher, The Snowflower Diaries and more although I haven’t stitched many of their works yet. Still I like them! Now it has to be The Balinese Dancer by Thea Gouverneur which I recently finished after having it left unattended for ages. It was so difficult for me and had so many colours but I did it! I can’t say I have one. I am usually a disaster when trying to finish a piece. I wish I could learn how to finish my pieces in other ways than framing them. I tried making some pin cushions but it didn’t go very well. 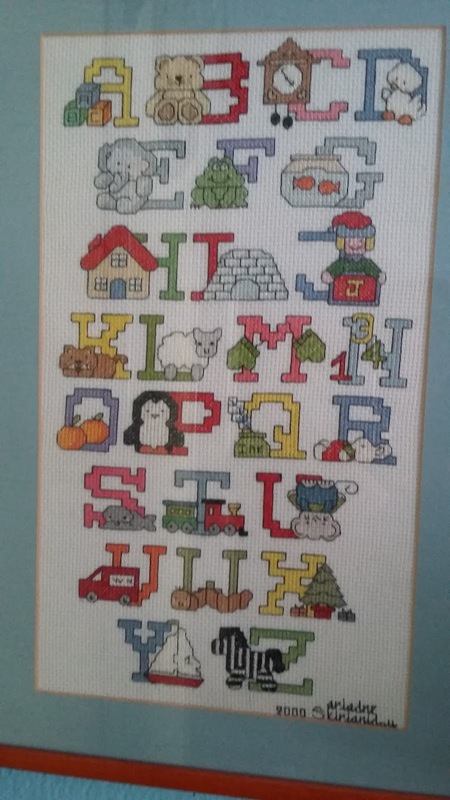 Lately I realised I love mounting cross stitched pieces on felt and make ornaments. I’d love to learn to crochet better than simple stitches and to embroider better. As I mentioned earlier my projects wait to be framed and as custom framing is expensive I have a waiting list of to-be-framed pieces.The smaller projects I give away as gifts. 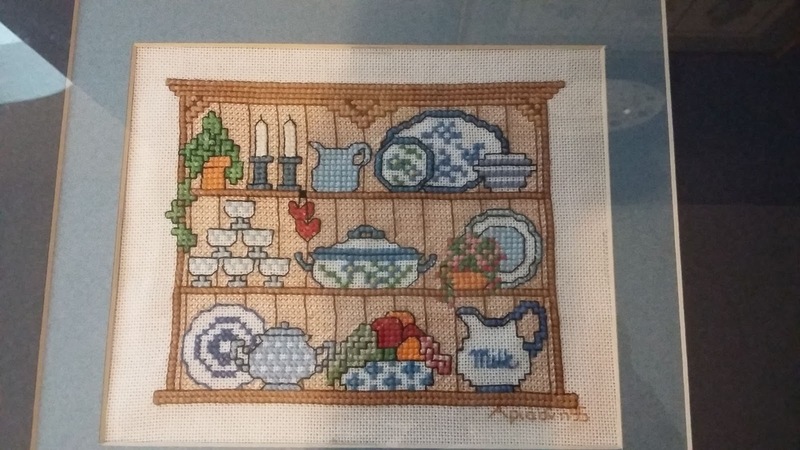 I think it is the collection of blue and white china frames I love this type of stitching that is stitching cups and teapots and china and want to make some more. A secret isn’t a secret if you tell! LOL! And that’s a joke! Ok to be serious I love stitching a little bit every evening in front of the TV while watching movies at the same time.It finishes my day in a relaxing happy way! 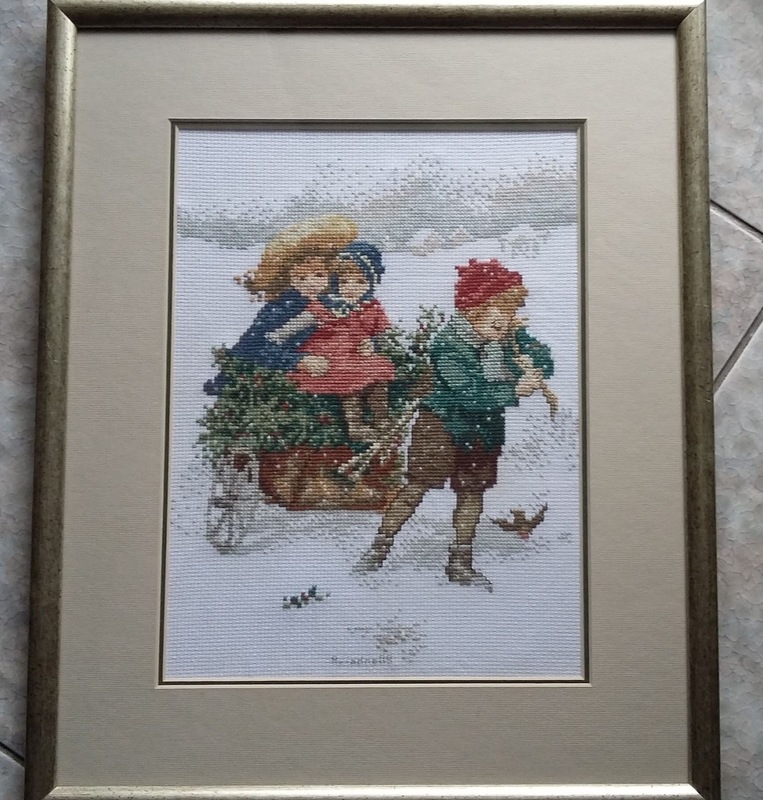 Thank you Jo for starting this blog and keeping the Blogger of the Week feature of one of my most favourite magazines Cross stitch Collection alive! Barca helping with the stitching! Nice to learn a bit more about you Ariadne. 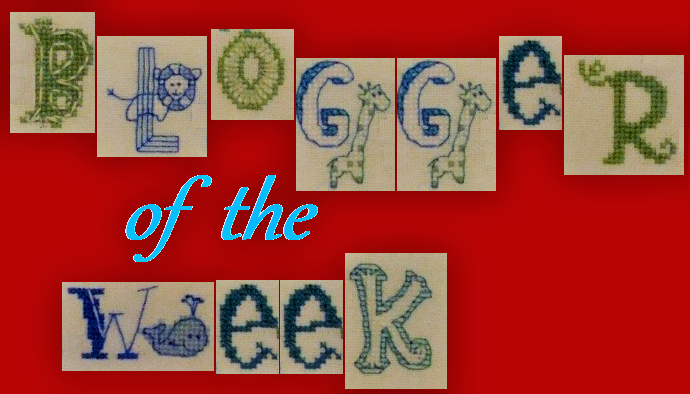 Nice to see you as Blogger of the Week, Ariadne. And so great to learn more about you and your stitching career. Your Bslinese Dancer is a real masterpiece, no wonder that you are very proud of having finished it. I also love your little collection of china - there is something about stitching cups and teapots, isn't it? By the way, I love your name. Whenever I see it it reminds me of my studies of ancient Greek at school, which I dearly loved. I am happy you like both my name and the blue and white china pieces!So nice to hear you have had Greek studies. I love the blue and white china patterns, that type of design has been in one of the UK magazines recently. 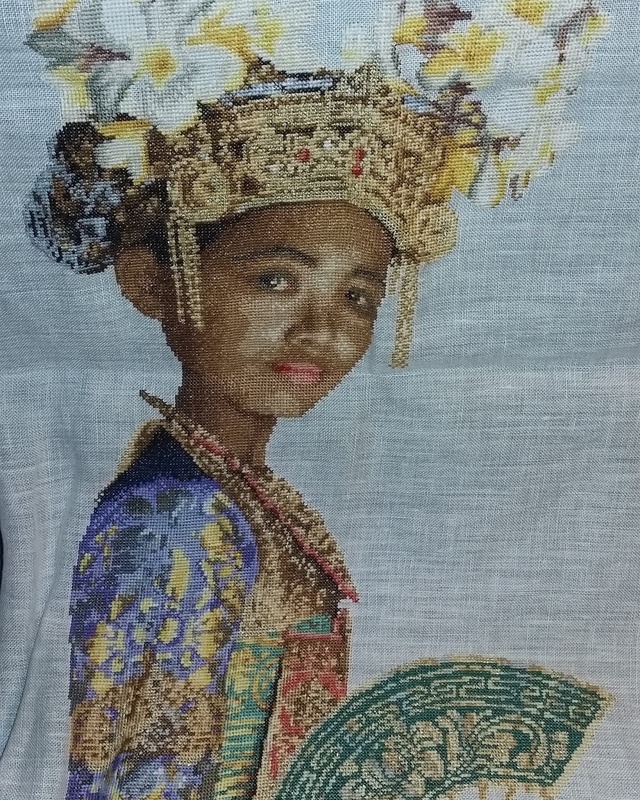 The Balinese dancer is stunning too. Which magazine do you mean?Maybe I can find it in Greece too. Thank you very much!I really enjoyed all those blue and white china patterns. I have enjoyed reading about you Ariadne.I am not surprised you are proud of your Balinese Dancer,she is beautiful. Thank you very much!Barca is a love at first sight puppy dog that lasts! It was very nice to learn about you Ariadne. Your collection is so varied and wonderful. Huge congratulations on the Balinese Dancer finish, once again! What a stunning piece!! Thank you dear, I am so looking forward to taking it home from the framer's! I've only recently discovered your blog (courtesy of Jo, of course) and I enjoy reading it. It's nice to learn more about you. Your Balinese Dancer finish is impressive. Thank you very much!It's nice meeting new friends in blog land! 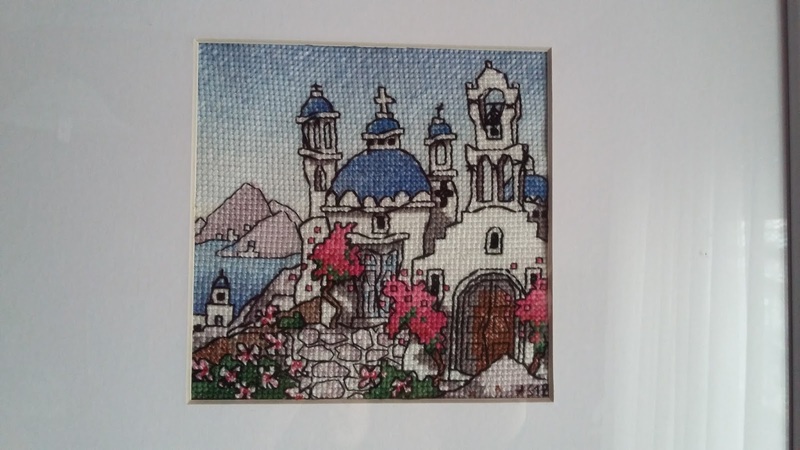 Such lovely stitching! So wonderful to learn more about you, and what nice friends you have that share with you! 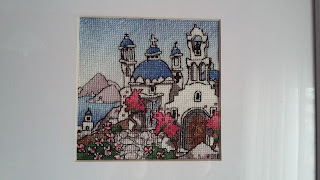 I just love this blog and to get a peek into different stitchers lives. Thanks for sharing Ariadne. Hello Ariadne, nice to meet you! 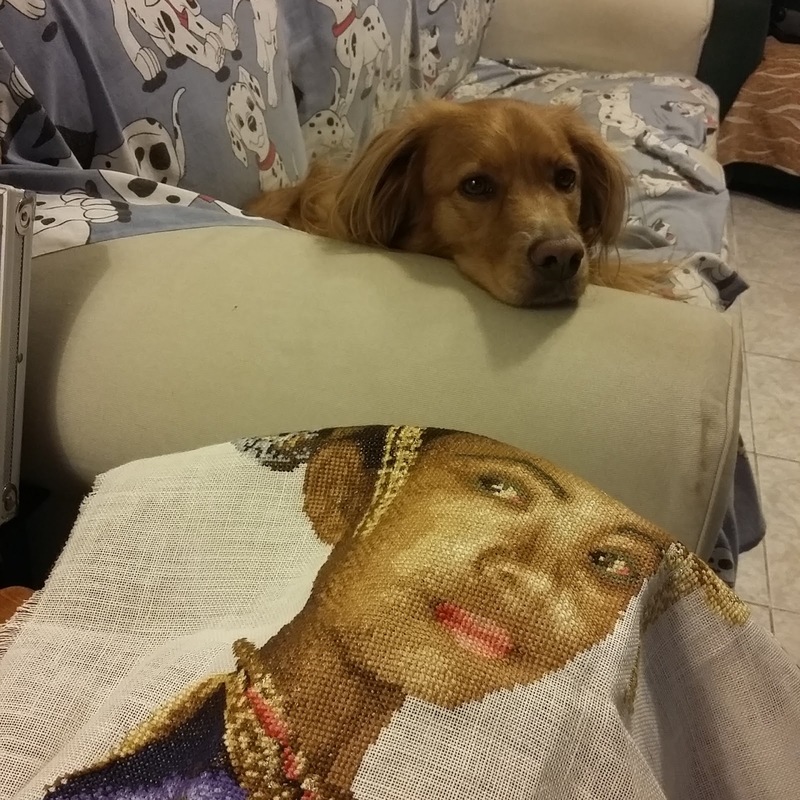 Your stitching is beautiful, and your Balinese Dancer is really stunning! I too have a hard time finishing stuff. I like framing, but there are only so many walls to hang stuff on! 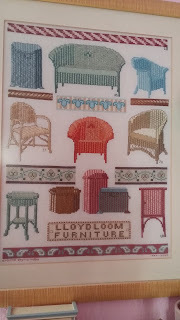 Lovely to read more about you Ariadne and see some of your finishes from before I started following your blog. I love the Lloyd Loom furniture stitch, it's really unusual, and your Balinese Dancer is absolutely stunning. I'm glad to hear you can still acquire stash despite the financial troubles in Greece! Very pleased to meet you Adriadne! Your stitching is beautiful and I can see why The Balinese Dancer is your favorite piece; she is STUNNING! 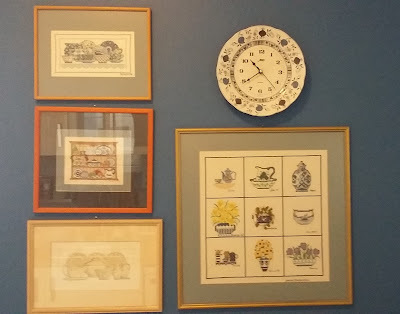 Your display of the Blue & White China collection reminds me of my Mom's kitchen where we were growing up. Love your puppy. Lovely to meet you! I love The Balinese Dancer and will have to find the chart. What a wonderful design! Your Balinese Dancer is absolutely beautiful! You live in a country I would dearly love to visit some day. If I do make it there, maybe we can meet and enjoy a stitching afternoon.